Addresses for jobs and interviews are released 24 hours prior to the start time to those who have accepted the shift/interview. You will be able to access the address directly on your app and on the interview posting as well. Please note: You WILL NOT receive the address if you are on standby for a job or an interview, only if you are promoted from the standby list. Trying to figure out where a job is before you accept it? 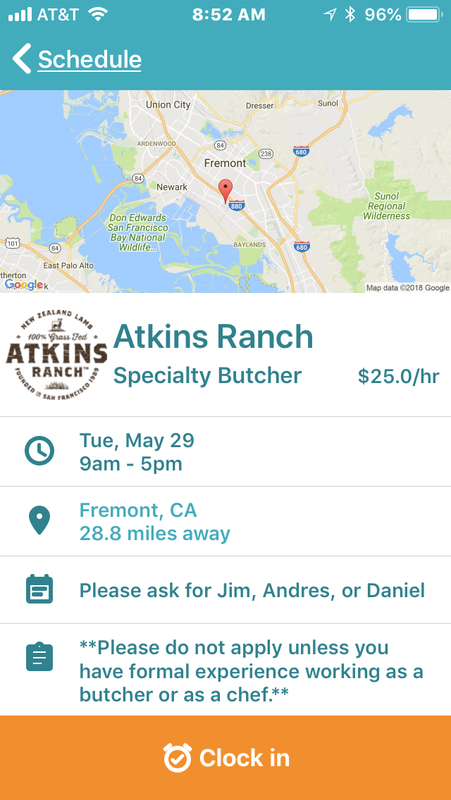 While we don't release the address, your app will show a zoomed in map of the general area of the job to give you an idea of its location. Once you've been accepted for the job, the address is accessible using a few different paths. You can click on the map or the pin drop with the city (in this example: Fremont 28.8 mi away) and you will be taken to Google Maps (or Apple Maps if you're using an iPhone). The address can be found once you make it into your navigation app, it will be in the destination bar. If you'd like to use a different Navigation tool or save the address, you can copy and paste the address for use elsewhere.